Used to paddling in remote areas with nothing but wilderness for company, we were surprised how fun it was to explore an urban area by canoe. Not only that but travelling through the locks turned out to be just as impressive an experience as I hoped. It was also surprisingly (and thankfully) easy! 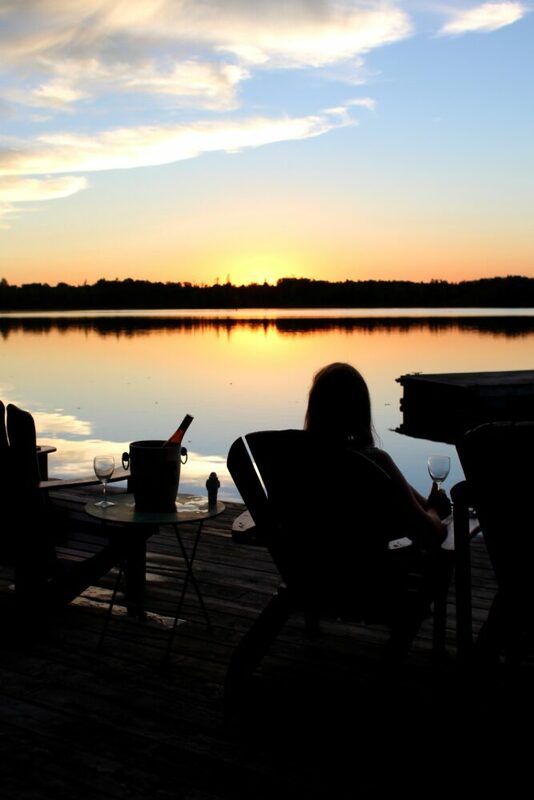 The Trent Severn Waterway travels between Lake Ontario and Lake Huron’s Georgian Bay, comprising a remarkable 386km of linked rivers, lakes and canals. 45 heritage locks (plus two hydraulic lift locks) connect the different bodies of water and are operated by Parks Canada. 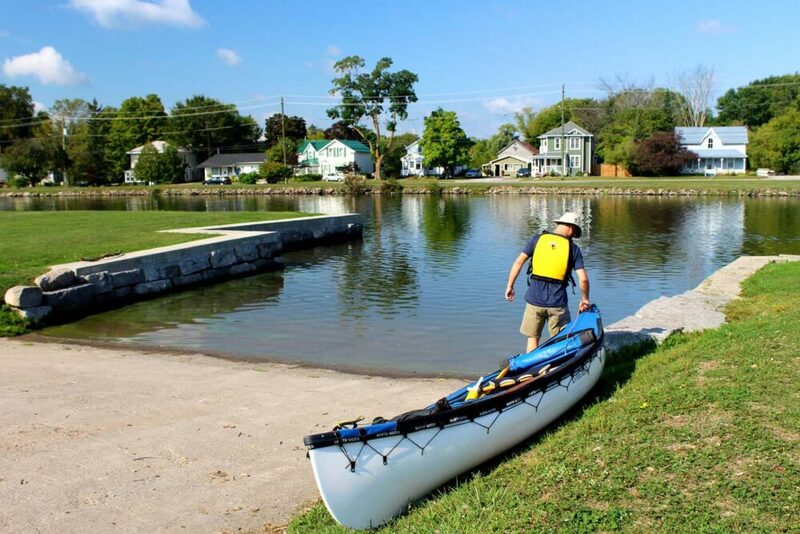 The latter is looking to extend usage of the Waterway beyond traditional boaters to kayak and canoe paddlers over the next few years, with new lower landing platforms being installed and the introduction of more waterside camping options. 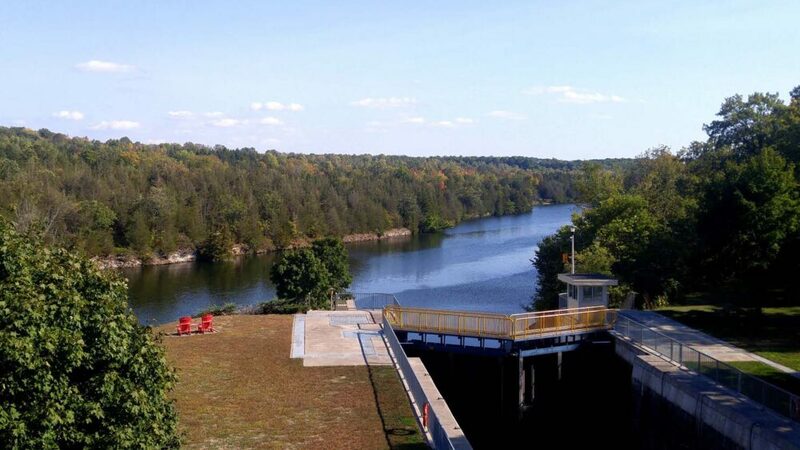 The Trent Severn Waterway is part of the new Champlain Route, based on Samuel de Champlain’s epic 1500km journey through Ontario in the 17th century. 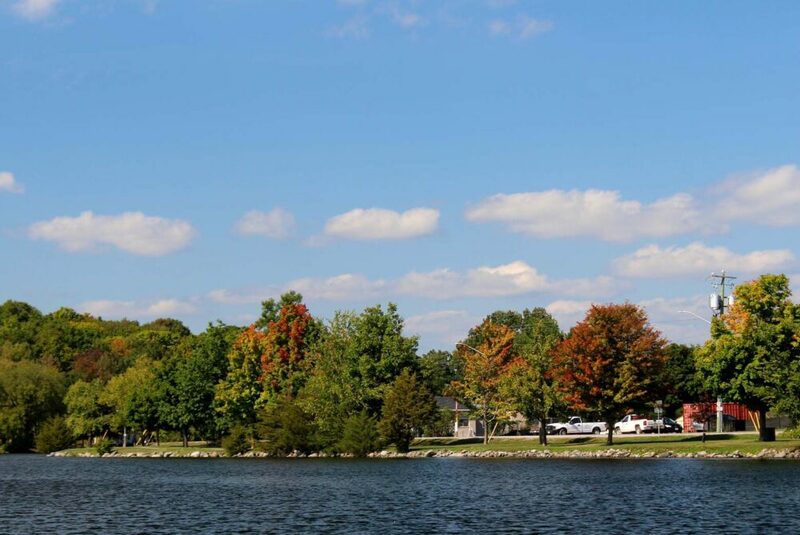 With the Trent Severn Waterway running through so many different communities and regions, there are so many potential paddling and boating opportunities no matter where you go. 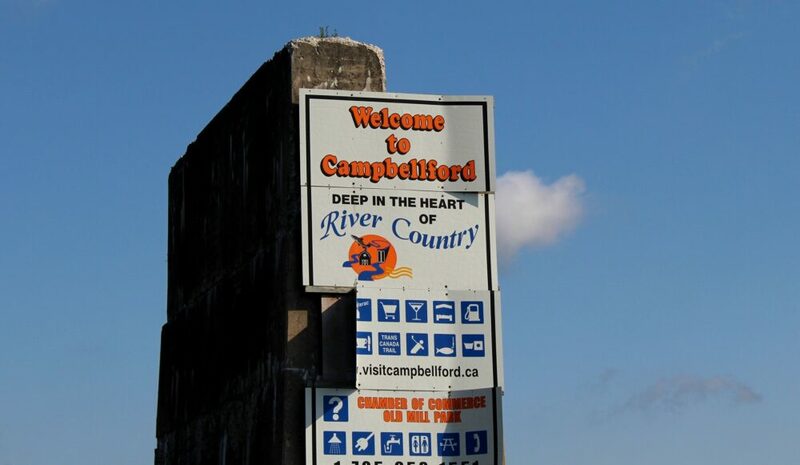 Our adventure took us to Campbellford, an approachable small town straddling both sides of the Trent. 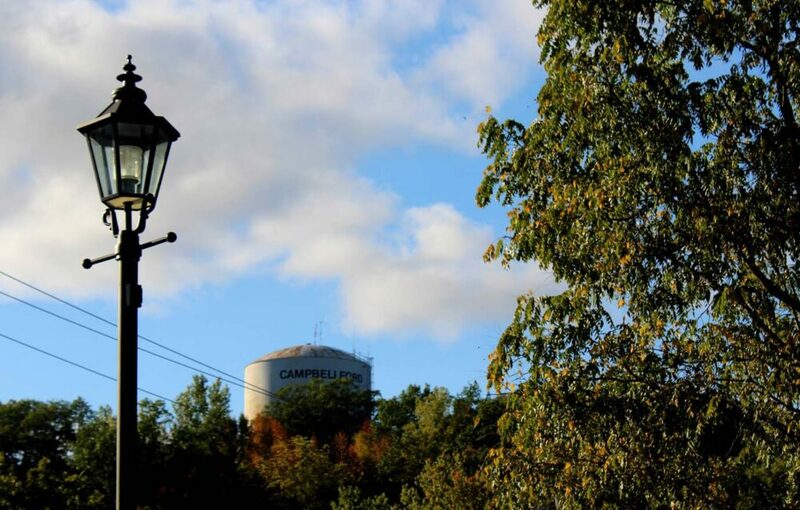 It may only be a two-hour drive east from Toronto but Campbellford and the surrounding Trent Hills area feel like a world away. Think rolling hills (almost too green to be true), endless farmland and friendly small towns dotted in between. A tractor on the main road here constitutes as heavy traffic. And yet, again, it is somehow so relatively close to Toronto. 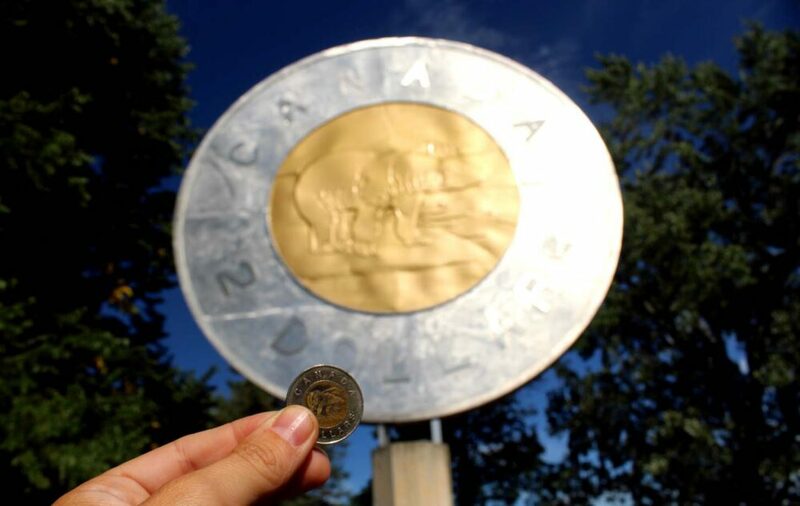 Before heading out onto the river, we made time to check out the giant toonie (two dollar coin) sitting in Campbellford’s Mill Park. Built to recognise the local artist who designed the polar bear motif, statues such as these usually tend to stick out like a sore thumb, but somehow we managed to completely miss it while walking along the Trent! Apparently, the polar bear on the coin is called Churchill. Mandatory photos taken, it was time for a paddle. Launching just a few streets away from downtown, we first headed back upriver to see Campbellford from the water. It’s a popular place for boaters to stop over and I can see why. While the town does have an industrial edge (not helped by the amount of construction going on during our visit! 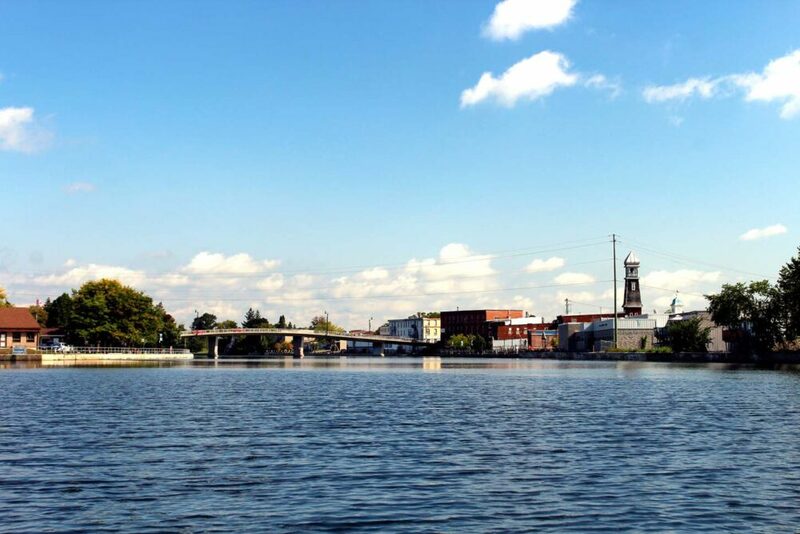 ), it is softened by the river, numerous heritage buildings and a walkable downtown area. The Trent itself is lined by trees that are sure to create a riot of colour in autumn. 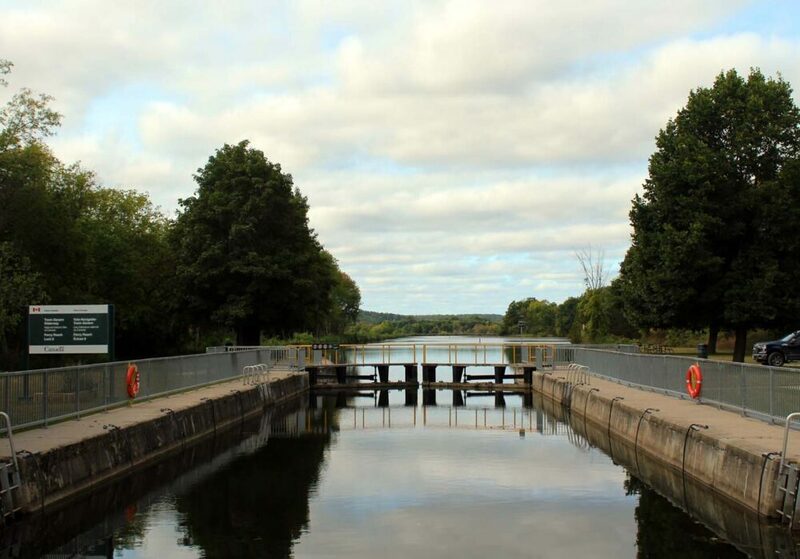 Only a short paddle downriver from Campbellford is Locks 11 and 12, a double flight lock that operates simultaneously to move both inbound and outbound boaters fourteen metres in height. It’s a little intimidating to look at whether on land and water, but even more so from the seat of a canoe! 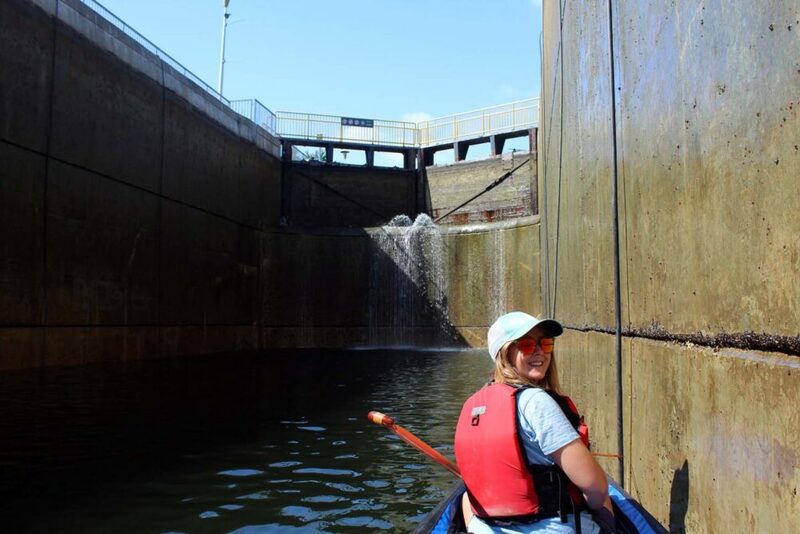 At the signal of the lockmaster, we paddled straight into the first lock and headed to the guidelines on the side. With the huge lock doors shut, all we had to do was loop our own rope (one at either end of the canoe) through the lines and hold on tight. For such a big system, locks do work awfully fast. 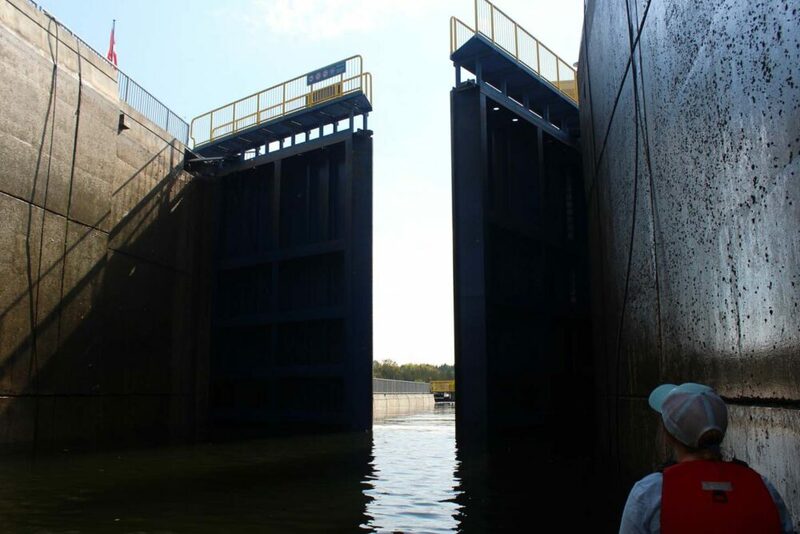 It only felt like minutes before the next set of doors opened and we were into the second section of the lock. Again, we held onto the guidelines while the water rushed out and finally brought us down to what would now be ‘regular’ water level. Paddling out of the lock, it was as if we had been transported much further into the countryside. We were now facing Ferris Provincial Park. 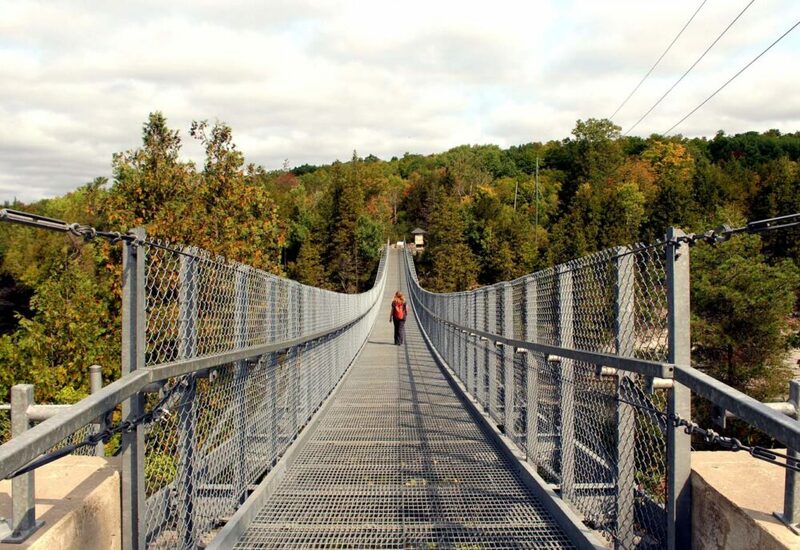 Just tucked around the corner from Trent Severn Lock 11/12, is Ranney Gorge Suspension Bridge. 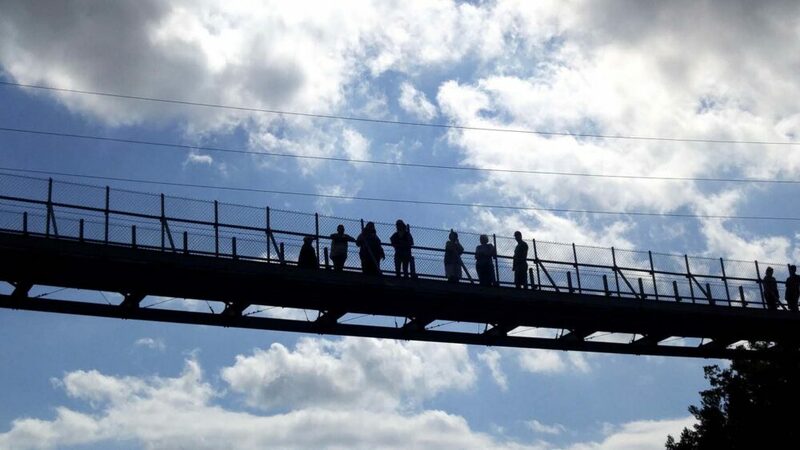 Part of the Trans Canada Trail and one entrance to Ferris Provincial Park, this pedestrian bridge sits ten metres above the river and looks towards thundering Ranney Falls to the north. At almost one hundred metres across, it is a pretty impressive sight from below, especially when you see it sway back and forth just a little in the wind. We returned the next day to walk along it ourselves and follow the trail along the river to a lookout above the falls. I love getting dual perspectives of beautiful places. My only regret is seeing this area just prior to the fall colours coming in as I have no doubt it would be stunning. Back on the river, we paddled towards the Ranney Falls a little to feel the force of the water before turning around and riding the current back under the bridge. We paddled downstream a kilometre or so to a private little picnic spot on the banks of the river. With the 3.30pm closure time of the locks on our mind, we headed back towards Campbellford after lunch. Ascending the locks was just as simple (though apparently, it can be more turbulent) and before we knew it, we were at our take-out point. A taste of the urban and wild, all in one day! For our paddle on the Trent Severn, we launched next to Campbellford’s Lawn Bowling Club, just south of the downtown area. There is a sloped boat launch here and a fair amount of parking. Another option for launching near Campbellford is a rougher boat launch just before Locks 11/12, on the western side of the Waterway. There is parking at the nearby lock. An alternative option, a little further downriver, would be to start from the boat launch in Ferris Provincial Park. 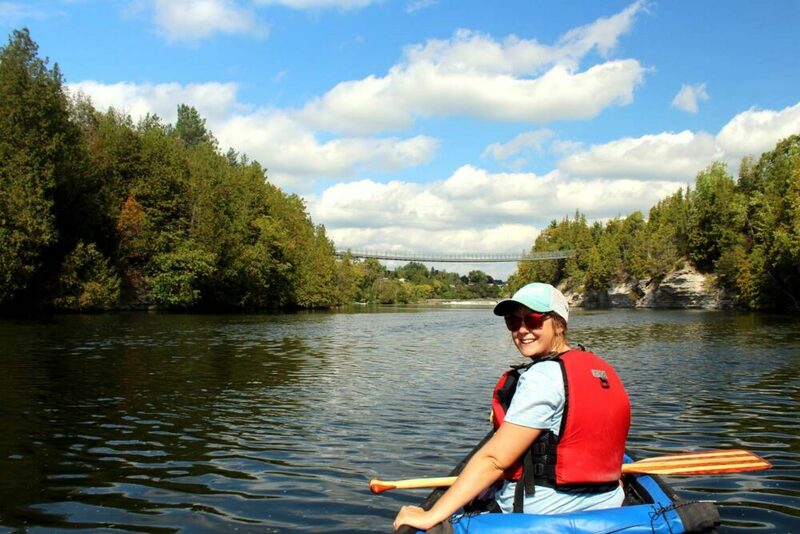 If you have two vehicles available, an ideal summertime day trip would be to launch just south of Campbellford (either of the two options mentioned above) and then paddle all the way to Lock 8. 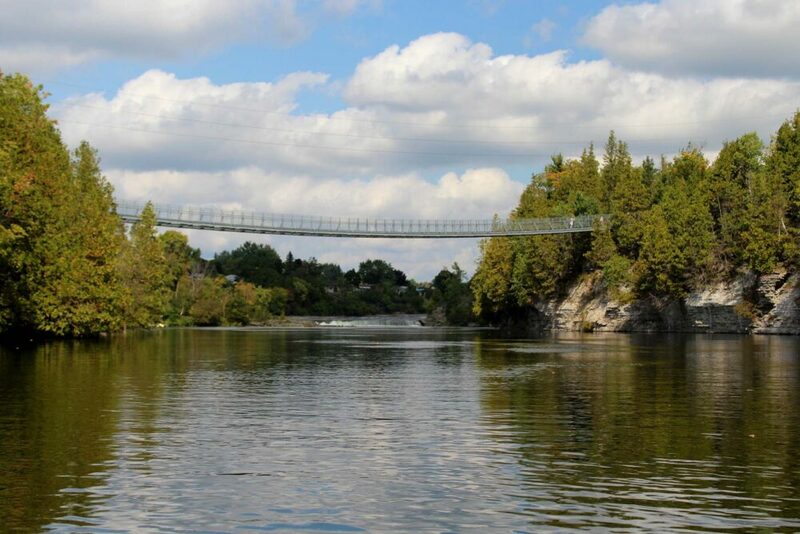 This is a lovely stretch of the waterway, featuring Ranney Gorge Falls and suspension bridge as mentioned above, plus Ferris Provincial Park. This is one of the quieter stretches of the Trent Severn Waterway for recreational boaters due to the concentration of locks in the area. In terms of distance, this day trip would cover about 8km, which should take the average paddler about three hours total at a very leisurely pace. 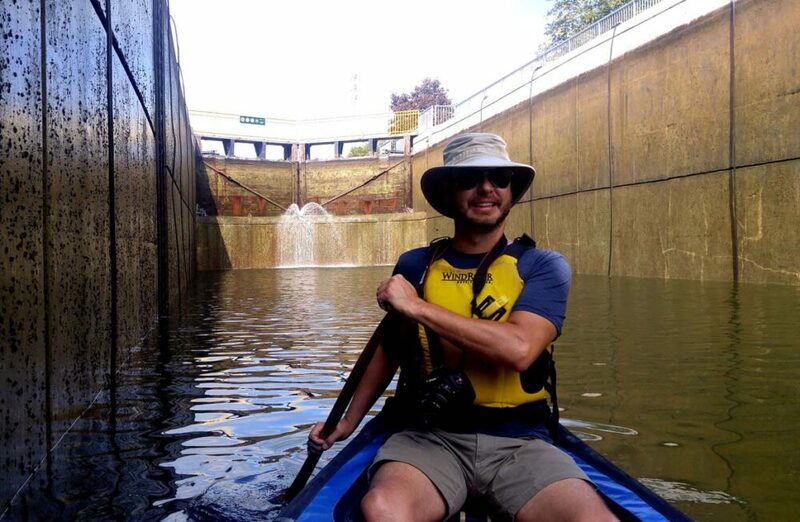 Paddlers would need to travel through the double lock system (11/12) plus locks 10 and 9 (allow 30 minutes per lock). 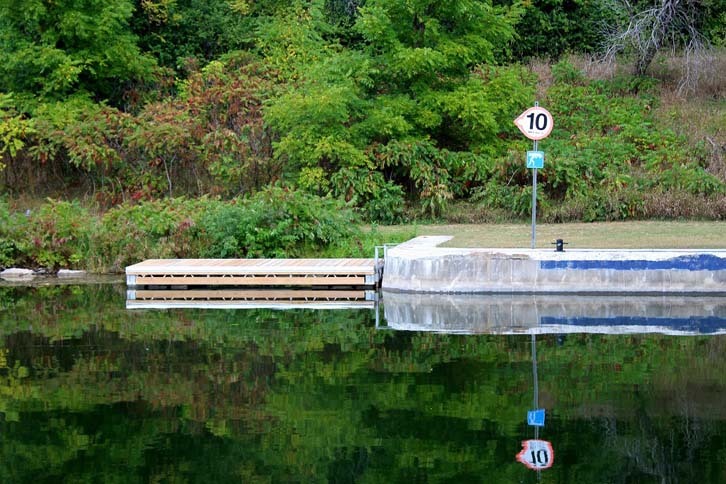 Lock 8 already has a lowered canoe/kayak dock, which makes it the perfect place to take out. Located right at the end of Kellener Road, Lock 8 also has plenty of parking. 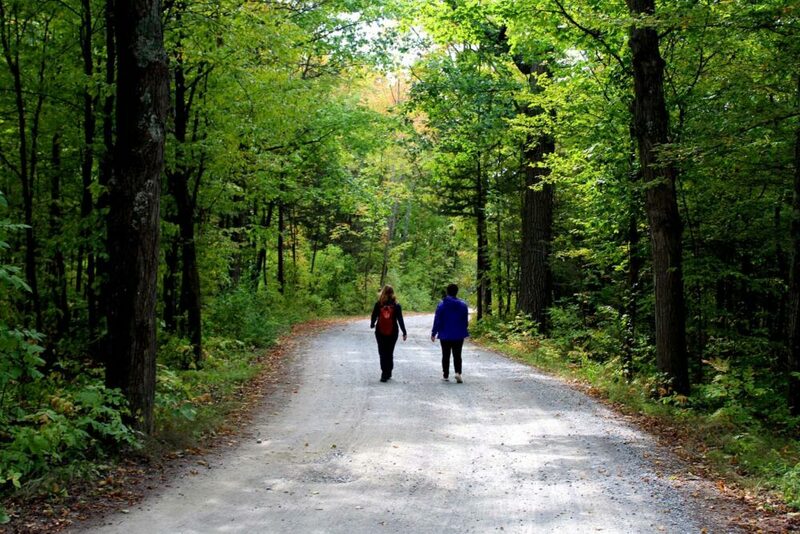 It is a twenty-minute drive from Campbellford. 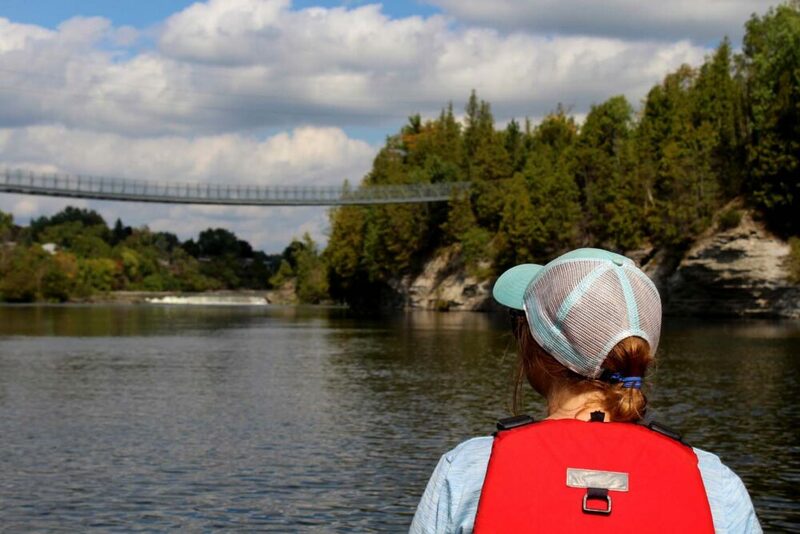 With 386km of the waterway to explore, the Trent Severn offers a wealth of potential paddling adventures. 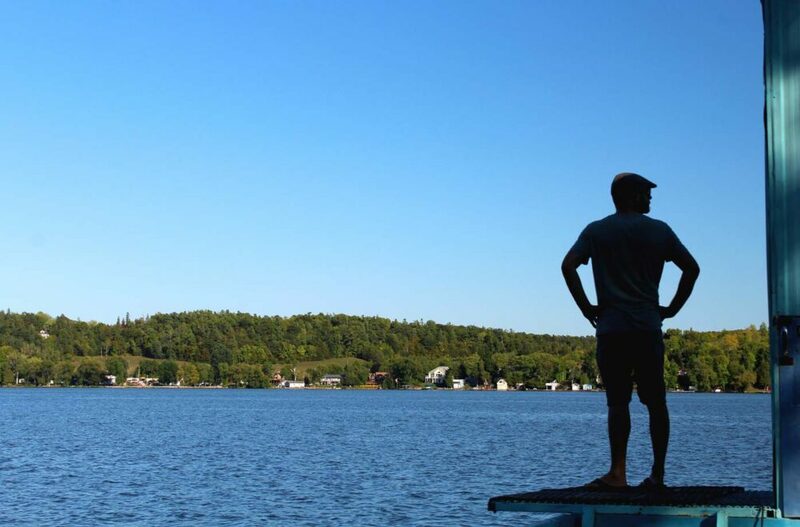 Our own short exploration of the area near Campbellford is only the tip of the iceberg of paddling opportunities in this area for canoeists and kayakers. The mix of urban and surprisingly rural landscape provides for an interesting style of paddling trip, especially for those prefer to enjoy the comforts (and security) of having civilisation close by. 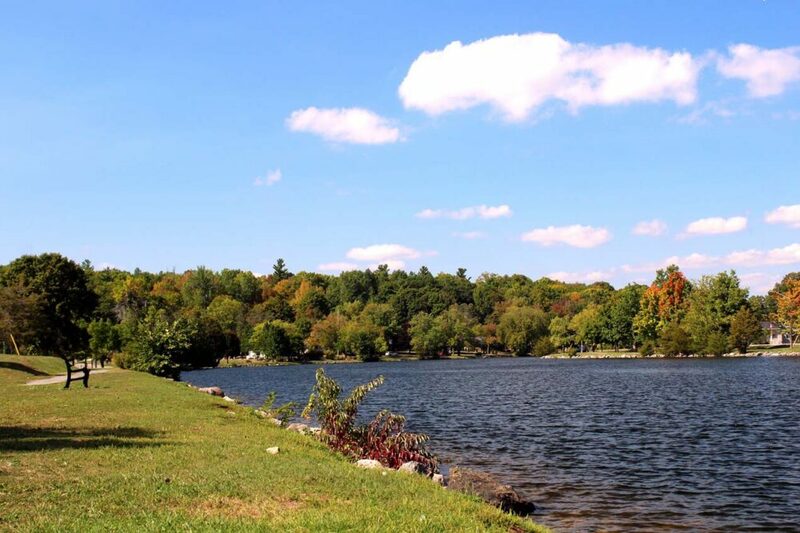 Many of the towns located on the Trent Severn play host to summertime festivals and events, providing a unique cultural angle on canoe or kayak tripping that is difficult to replicate in the wilderness. 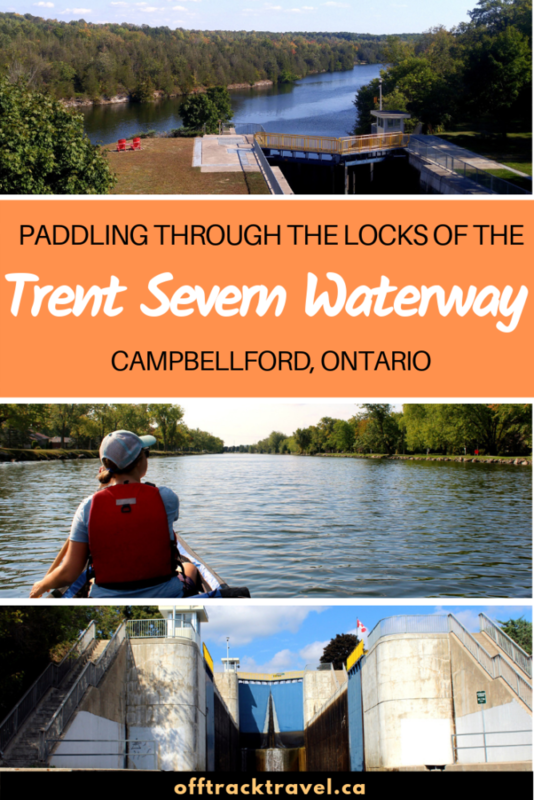 To use one of the Trent Severn locks, you must have a valid lock pass. These can be purchased on the Parks Canada website. As a ballpark, you should allow at least twenty to thirty minutes for travelling through each lock. Of course, this estimate varies hugely on the amount of other watercraft also padding through at the same time. In summer (June 22nd to September 3rd), there are lockmasters stationed at every lock during operating hours. 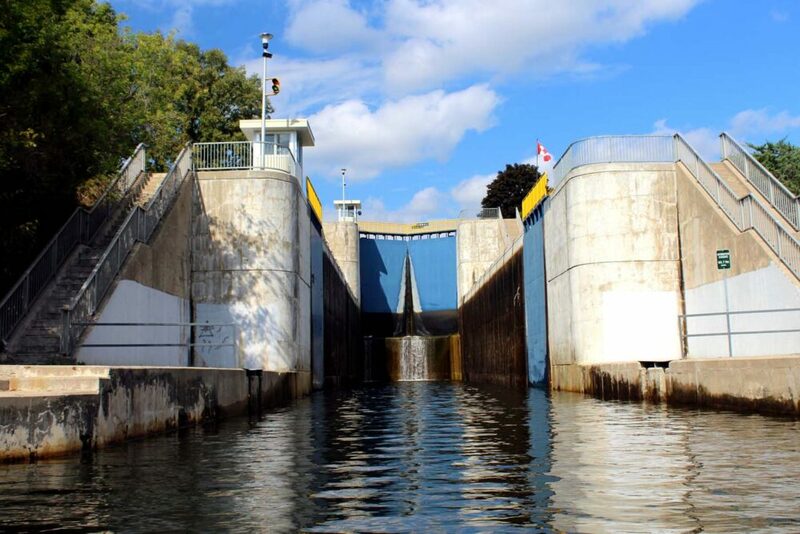 Outside of summer, operating hours are reduced and groups of locks are often operated by one lockmaster team who will travel and run other locks as required. Consequently, it is necessary to plan your route carefully in the quieter season to avoid getting stuck between locks. 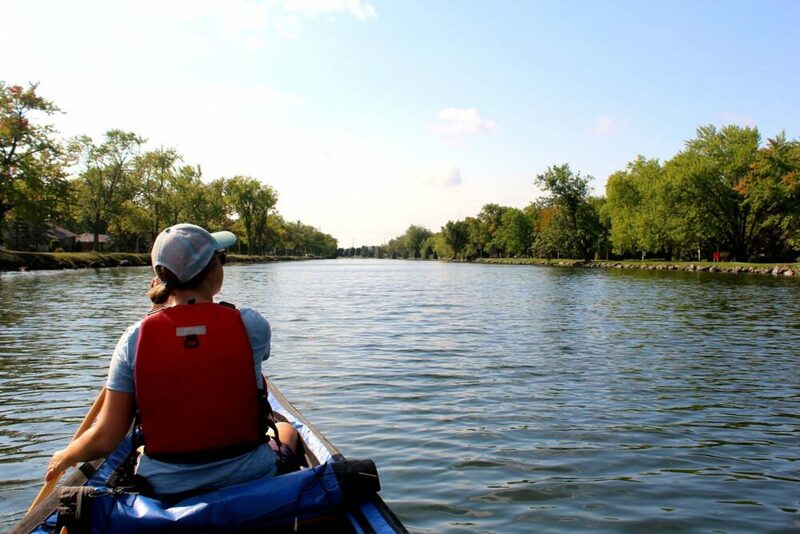 As previously mentioned, Parks Canada is working towards improving the accessibility of the Trent Severn Waterway for kayak and canoe paddlers. 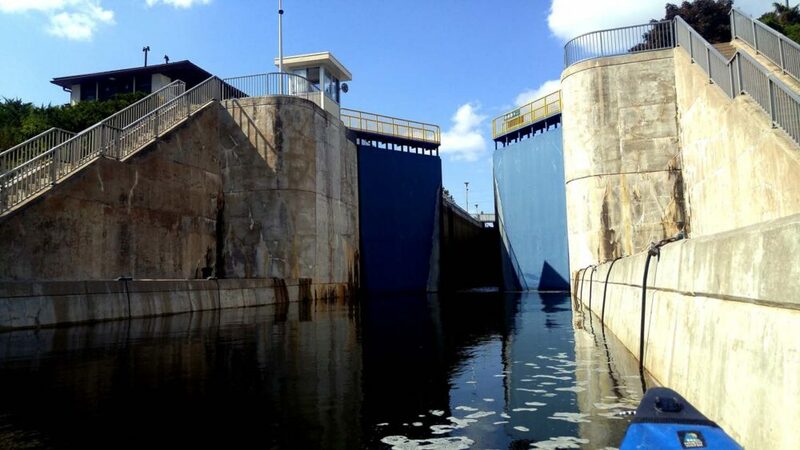 At the time of writing, only a few of the 45 locks have lowered docks to allow for easy water access. Providing more camping facilities for paddlers at some locks, particularly in the ‘ready to camp’ style (e.g. oTENTiks), is also in the works. 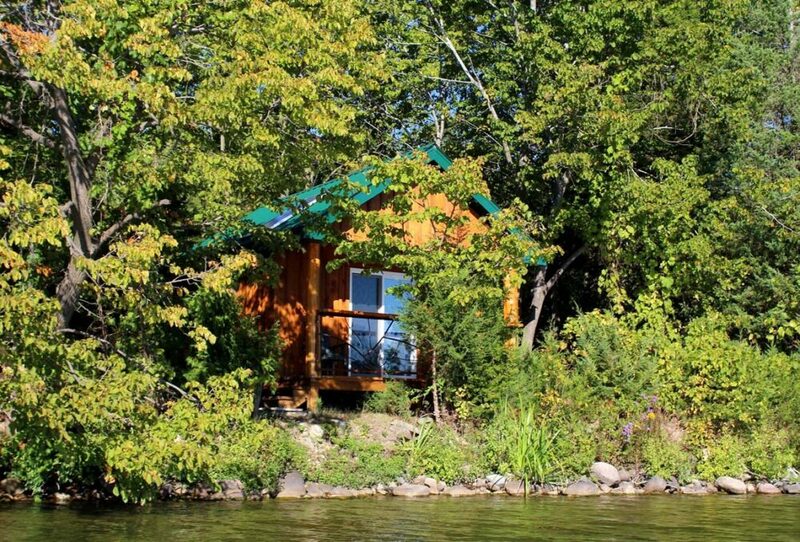 There is an abundance of accommodation located directly on the Trent Severn, ranging from private campgrounds to lake resorts and B&Bs. 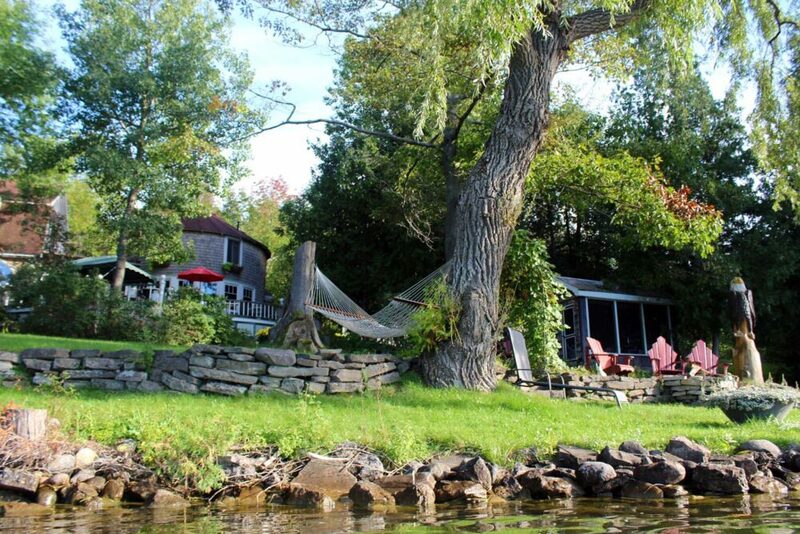 Two such examples are Windswept on the Trent B&B located between Campbellford and Hastings (beautifully restored heritage buildings right on the water, a perfect romantic hideaway) and Island Spirits on Rice Lake (eco-camping and cabins on a private island, ideal for groups). As noted above, Parks Canada is developing camping facilities at the locks. Currently, you can pitch a tent next to most locks for the bargain price of $4.90. There are also ‘ready to camp’ oTENTiks at Locks 24 and 25. Like this post? PIN or save it for future reference with the above image!